Between 1803 and 1813, Jean Joseph Tranchot and his team began to topographically map the Rhineland, including the Saar and Mosel, as instructed by Napoleon. Karl Freiherr von Müffling completed the series of maps under Prussian rule from 1816 to 1820, including other sections in 1826 to 1828. A total of 264 sheets were hand-drawn on a scale of 1:20,000. The Tranchot map (Tranchotkarte) shows all the vineyard land during this time. On the earlier sheets, these are marked in pale red with a capital "V," for vignes, or vines. The white areas, marked with a capital "T," show terres labourables, or farmland. The yellow areas with a "B" stood for bois, or woods, and so forth. Other sheets had a different set of color codes. Many of today's vineyards had first been planted in the latter half of the 19th century or the beginning of the 20th century. In other words, growers planted the most privileged sites first and cleared and planted vines in other sections—whether further across or up the slope as well as on other hillsides—later on. The best sites, including most of the new plantings, were often on south-facing slopes. The left bank of the Rhine was under French control from 1795 till 1814 (see "Wine and War – 1814 till 1914" for more on this). It should be noted that some of the sheets, such as the one titled Trier-Ost (Trier East) from 1816/17, which includes Maximin Grünhaus, don't show the vineyards as clearly as other sections of the map. Von Müffling oversaw these. 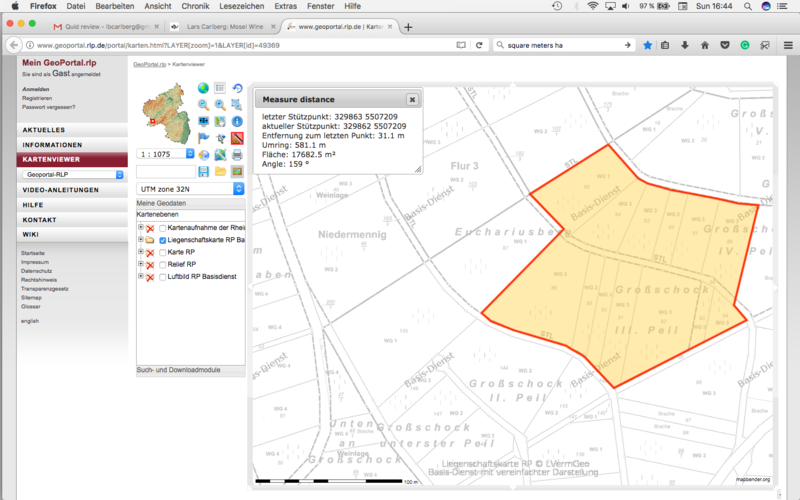 I recently discovered that the survey of the Rhineland from Tranchot and von Müffling (1803–1820) can be superimposed on the cadastral maps, thus indicating the exact plots of land and if they were planted with vines back then. On the Saar, one can search a place, like "Ayl" or "Scharzhofberg," and zoom in and out and go back and forth between the two maps. "The finest vineyards of the Saar are on the right bank of the river, from Geisberg in the south to Euchariusberg in the north," André L. Simon says in Wine and the Wine Trade (Sir Isaac Pitman & Sons, Ltd., 1921). Reichsgraf von Kesselstatt and Hofgut Falkenstein have sizeable holdings in the core sector of Euchariusberg. The southwest-facing place-name listed as "Euchariusberg" on the cadastral map is shaped like a cake slice and mostly owned by von Kesselstatt, which replanted this vineyard several years ago. The Webers have holdings on the prime south-facing hillside in the place-name Großschock, which, altogether, add up to a contiguous 1.8-ha block in the core sections with the Roman numerals III and IV. Simon goes on to say: "Not far from Geisberg is Bockstein, and a little further on the famous Scharzhofberg, the finest growths in the Saar valley. Two other celebrated bergs are Scharzberg and Agritiusberg, whilst excellent wines are also made a little further north at Wiltingen and Oberemmel." He gets this right, but he forgets to mention some of the top sites on the left bank, namely the best-known sites in Ayl (Ayler Kupp) and Wawern (Herrenberg). In the Ruwer Valley, he only lists Grünhaus. In the postwar years, most of the south-facing slopes had vineyards. This was the same in other parts of the Saar. "On every slope that faces south, or nearly south, you can see the orderly green pattern of perfectly tended vines," writes Frank Schoonmaker in his Wines of Germany (Hasting House, 1956). The whole district was nevertheless the scene of heavy fighting during the early spring of 1945. The anti-tank defences, the so-called "dragon's teeth" of the Siegfried Line, ran through some of the best vineyards, and when I visited the Saar for the last time before the War, in the summer of 1939, pill-boxes were even being constructed in the gardens of my good friend, Herr Koch, of Wiltingen. I remember that I congratulated another friend, in Oberemmel, on the completion of a magnificent new barn, which looked most impressive from a distance; he winked and whispered to me that it was a very wonderful barn indeed, with "walls of concrete one and a half meters thick." When I returned in 1946, the pill-boxes, like the "barn," had been destroyed, both the whole Saar Valley was still littered with ugly debris of war. There were still brass cartridge cases in the grass along the roadside, and there was still a fighter plane [P-47 Thunderbolt] which had crashed and miraculously not burned, smack in the center of the Scharzhofberg vineyard. A good many of the villages had been damaged by shellfire, many of the vines overrun by tanks, and there was plenty of others that had been neglected and seemed lost beyond repair. 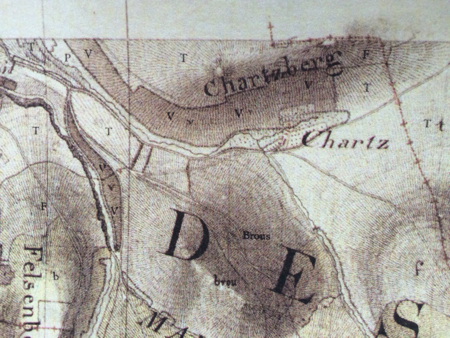 On the Tranchot map, the Scharzberg—that is, the hill—is listed as "Chartzberg." Not all the slope in what is today the Scharzhofberg was vineyard land. The eastern flank was marked "T" for farmland, and the top half, including Pergentsknopp, was listed with the letter "F" for fallow. If one looks at the cadastre, the section known as Oben im Alten Scharzberg (above in the old Scharzberg) was the eastern edge of the vineyard in 1812—namely, the "V" under "berg" on my photo. (The bordering place-name Oben im Neuen Scharz was not planted to vines.) The heart of the Scharzhofberg is called, appropriately enough, Im Besten Scharzberg (in the best Scharzberg), which includes Egon Müller's block of ungrafted, old vines in "Dem breiten Weinberg" (the wide vineyard), located nearby the manor. The vineyard area in what is now the Scharzhofberg was only about 13 ha instead of 28. It was the section from the foot of the hill to mid-slope. In Ayl, the two hillsides planted with vines were Ayler Kupp and Scheidterberg. 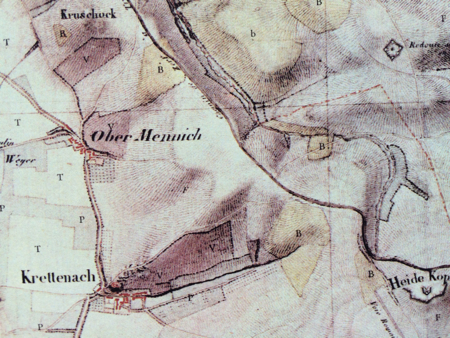 Rauberg, Lambertskirch, and Schonfels had no vines when Tranchot mapped the area. In addition, the original pre-1971 Ayler Kupp had vines mostly in the place-name Im untersten Berg. (See "Ayler Kupp: A Short History" for more details.) Today's Saarburger Rausch, which includes the former Antoniusbrunnen and Bergschlossen, was entirely planted to vines in 1812. In contrast, the upper half of the present-day Bockstein had no vineyards back then. This includes the place-name Heppenstein, which was cleared of coppiced oak (Lohhecken), like many other south-facing hillsides in the region (most notably Serrig), at the turn of the 20th century. This evening, Daniel Deckers gave a lecture on Tranchot at the Stadtbibliothek Weberbach Trier. I would have missed this date if Franz Irsigler hadn’t told me earlier that day during the harvest. Deckers explained that Tranchot was an engineer-geographer who was instructed by Napoleon to map the left bank of the Rhine, which was considered, even by Victor Hugo, as rightfully belonging to France. The Rhine was the natural border. The French, who had expert engineer-geographers, were the leaders in hand-drawn survey maps. The map of Cassini of the entire kingdom of France was the first based on triangulation. Later on, under Napoleon, the first cadastre maps were drawn by the Dépôt de la Guerre, the corps of engineer-geographers, mapping parcels of land, including their usage, tax value, and so on. As Deckers pointed out, the work of Tranchot was an extension of the work from Jacques Cassini and unique in its detail and beauty, as well as showing the vineyard land of the Saar, Mosel, and Rhine regions. The French started drawing the maps of the Rhineland in 1801. Tranchot and his staff began with the sections along the Lower Rhine region first. He later moved his office to Trier, where in 1808, he got married. His wife gave birth to two children in Trier. Tranchot never saw his second child, as he died of a stroke in Linas, near Paris, on April 30, 1815. Afer the Treaty of Paris, in 1815, Deckers said, that the French were required to hand over all the maps to the Prussians in Berlin, where, to this day, the originals remain. The French were given only a short deadline to make copies of their work as fast as they could. Under Karl Freiherr von Müffling, the Prussians continued the work of Tranchot. These were for the military and not made public. I made a note to myself that the Prussians also made a map of the Rheingau. This was a little different from the earlier Dünkelberg map of the Rheingau (1867), which Deckers discovered in Wiesbaden. He also mentioned a book by a Herr Bärsch, who rated Grünhaus as having the best wines of the Mosel. Later on, under Napoleon, Brauneberg was ranked alone at the top. Deckers briefly talked about Otto Beck’s painstaking work in classifying the vineyards of the Mosel region for the Prussian government. This was the basis for Franz Josef Clotten’s 1868 Viticultural Map of the Saar and Mosel. After the lecture, wines were served from the following VDP estates: Maximin Grünhaus, Zilliken, Reichsgraf von Kesselstatt, Piedmont, Schloss Saarstein, Fritz Haag, and S.A. Prüm. I tasted a Spätlese from Grünhaus and then headed home for the evening. On December 19, Frankfurter Allgemeine Zeitung published a piece by Daniel Deckers about Napoleon and the Tranchot map. It should be noted that all of the present-day Saarburger Rausch (Saarburgerberg) was planted to vines in the early 19th century. The same cannot be said of the Scharzhofberg, Grünhaus, or Ockfen, which back then were all more highly rated sites. For whatever reasons, the wines from Saarburg were largely underappreciated. This didn’t change during the Saar and Mosel’s heyday in the 1890s, even though Geltz and Wagner, both based in Beurig at this time, produced wines from this impressive hillside. As mentioned in an earlier comment, Grünhaus comprised the main part of today’s Abtsberg and Bruderberg, not Herrenberg. On the Tranchot map, today’s Krettnacher Altenberg was only the main south-facing slope. None of the other sections were planted at the time of Tranchot. Where the main dome-shaped hillside begins to face more southeasterly was the old border. (At the far end, it faces more to the southwest.) In other words, a Krettnacher, or a wine from Krettnach, was just this slope, also known as Krettnacherberg (Crettnacherberg). The designation “Silberberg” for a section of the hillside came much later and is not on the cadastre. Großschock is not only a place-name for a certain sector on the south-facing slope of Euchariusberg but also another name for the hill itself. That’s why Tranchot wrote “Kruschock,” which, at the time, was the only part of the hill that was planted to vines. It was about 5 hectares and comprised the place-name Großschock and a small section of the place-name Euchariusberg. Kleinschock (or “Schock” on the first edition of Clotten’s Viticultural Map of the Saar and Mosel) is the next large hillock further north.